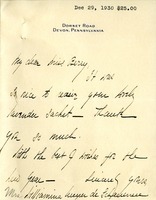 A. Randolph writes to Martha Berry thanking her for a lavender sachet that she sent. Sarah Fleischman thanks Miss Berry for the little bag of lavender and wishes her a successful new year. Anne Douglas thanks Martha Berry for the sachet she sent. Martha Berry is thanked for sending a thoughtful gift. Isabella P. Intton writes to thank Miss Berry for the lavender sachet and the homemade candy and encloses a check. 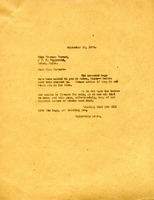 Miss Turner writes to say that she would like to purchase the bags and perhaps another year she could buy the flowers. She also advises that she will be leaving Sebec soon so she sends another address. The Berry Schools write to Miss Turner to inform her that they are returning the money because they thought it was the lavender bags she ordered but they cannot sell the stalks. If Miss Turner would like the bags they could get them made after September 12th. Miss Berry writes to inform Miss Turner that she has mailed the lavender bags to Sebec and asks her to let her know if they do not arrive. She also lets her know that the lavender stalks and flowers are not for sale. 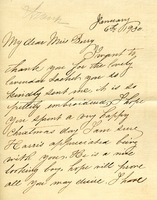 Miss Berry writes to Miss Armes to let her know that bags have been sent to Miss Turner at Sebec and explains that she is writing to Miss Turner. She also asks if Miss Armes still wants the lavender bags to be sent at the end of the month. 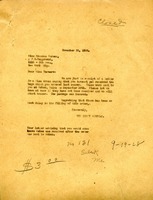 The Berry Schools write to Miss Turner to say that the bags were sent to her at Sebec, Maine and asks that she let them know if they have not been received so they can start a tracer. 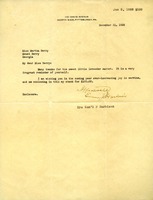 Mrs. Smiley writes to congratulate Miss Berry on the success of her work and the Pictorial Review award. She also thanks Miss Berry for thinking of her with the lavender sachet. After reading The Southern Highlander she is ready to give thousands of dollars but cannot because her family is in debt. 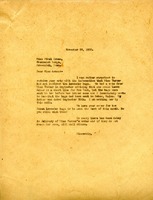 Helen writes to Martha with her contribution to a Berry Scholarship, and writes about her joy and time she spent with Martha at Berry. 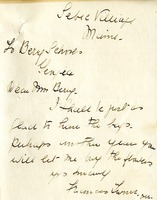 Emma writes to Martha thanking her for the lavender sachet and with her check of 100 dollars. Mrs. Clark thanks Miss Berry for the Christmas card, the picture of Miss Berry and the lavender sachet. 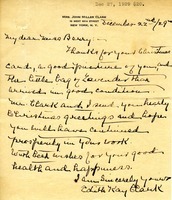 She sends wishes for continued prosperity in Miss Berry's work and health and happiness for Miss Berry.